To mark Evangelion: 3.33 You Can (Not) Redo's Blu-ray and DVD launch, burger chain Lotteria is unleashing a jumbo hamburger in Japan. 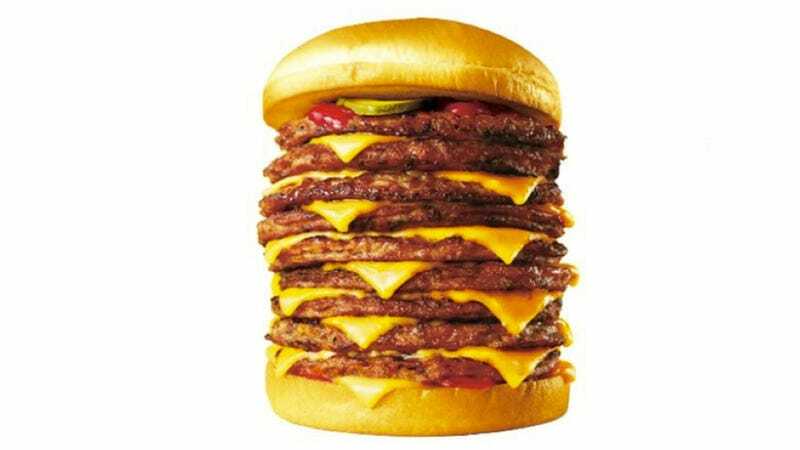 It's called the "Q-Story Cheese Burger", because, in part, the movie's Japanese title is Evangelion Shin Gekijouban: Q. It's also wordplay: The burger has nine patties, and the Japanese word for nine is "kyuu". GEDDIT? So clever. Lotteria sure loves the burger puns! Bundled with a Spear of Longinus fork, the burger is 1,280 yen (US$12.86) and goes on sale April 24 until the end of May. In the last few years in Japan, especially since the McDonald's Mega Mac, fast food chains like Lotteria have been offering silly-sized burgers. It's a thing. A high calorie thing. In case you missed it, here is Kotaku's review of Evangelion: 3.0 You Can (Not) Redo.